Oh my, it has been a while hasn’t it? Since I have been over here, gabbing about this and that. Suffice to say that a LOT as been going on. Yes, as much there has been absolutely nothing going on here! And even as I quickly send this post out, much is demanding my attention so I will make this brief — We’re moving! This isn’t a cross-country venture, and we aren’t upgrading to that stately chateau with adjoining pig farm just yet. In fact, we are just moving across our little central business district, from one “village” to another. But it’s a move nonetheless (a bigger place yay!!! with extra room and a real lobby and doorman! ), requiring all the packing, sorting, sweating, and dust-inhalation that all moves entail. PLUS, the complete renovation of the new place. Hence the silence over here. And it heavies my heart to say it, but there will be more silence to follow as this will be my last night online in our wonderful, old, little flat. After this it’s all up to our local broadband gods to get me safely online on the other side…where a mountain of unpacking await. The big day is tomorrow, when, if all goes well, we will be sleeping in what will be our temporary home until the renovation is done (which should be done by early next year). I can’t promise when I’ll be back with food and photos (my oven will be packed up until we move to our new flat) but we will have to eat…so please check back if you are not too impatient. Our temporary home has a little two-burner and a small oven which I am sure I can convince to churn out something delicious! Time to cook has been sparse but I really needed to throw myself together a store of healthy snacking to help me through this move. 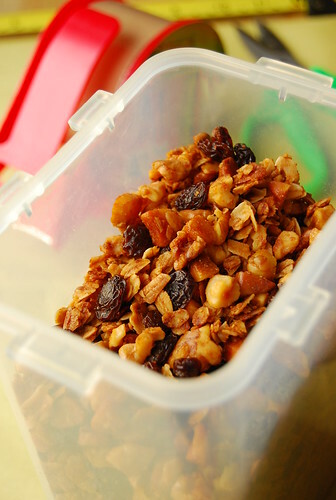 This granola is just the thing…and easy to throw together between packing boxes.